Noreen Renier has often stated a Psychic Detective should be called into an investigation as a last resort, when traditional methods have been exhausted. It's possible that Psychic Investigator Noreen Renier has a key for re-opening your dead-end cases. She has an impressive track record and uncanny success in finding missing persons. 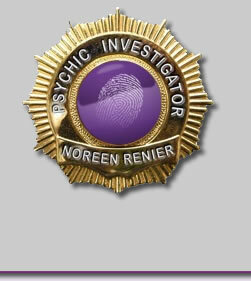 Perhaps Psychic Detective Noreen Renier can help you find new leads for your unsolved cases. It is possible that the information she picks up could provide clues, or a different angle to your unsolved crime. - Detective Sgt. John Buchholz of the Oxford, Ohio, police department told to The ENQUIRER. "...She helpd to locate a plane containing the body of a relative of an FBI agent."